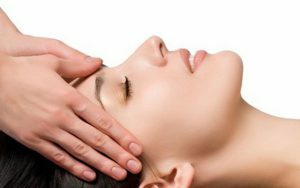 Indian head massage is traditional massage treatment originating from India. It involves the application of massage techniques. To the upper back, shoulders, upper arms neck face and scalp. a safe simple, yet effective therapy that not only promotes hair growth, but also provides relief from aches and pain it is renowned for relieving symptoms of stress and many other stress-related conditions. Treatment can be done with or without oils whiles the client sitting and fully clothed, in an ordinary every day chair. Helps to relieve stress, anxiety and depression through its uplifting effects. A client’s reaction to Indian head massage might be different according to their physical and emotional condition. If the body has been under a lots of stress it is not uncommon for there to be some kind of reaction as the body attempts to regulate itself to its own natural balance. Feeling of tiredness this is often replaced by a feeling of revitalisation due to the release of toxin. An increased feeling of awareness; clients often experience a feeling of calm, peace and tranquillity.